The Sun is the star at the centre of the Solar System. It is a nearly perfect sphere of hot plasma, with internal convective motion that generates a magnetic field via a dynamo process. It is by far the most important source of energy for life on Earth. Its diameter is about 1.39 million kilometres, i.e. 109 times that of Earth, and its mass is about 330,000 times that of Earth, accounting for about 99.86% of the total mass of the Solar System. About three quarters of the Sun's mass consists of hydrogen (~73%); the rest is mostly helium (~25%), with much smaller quantities of heavier elements, including oxygen, carbon, neon, and iron. It just happens that the Moon and the Sun appear the same size in the sky as viewed from the Earth. And since the Moon orbits the Earth in approximately the same plane as the Earth's orbit around the Sun sometimes the Moon comes directly between the Earth and the Sun. This is called a solar eclipse; if the alignment is slightly imperfect then the Moon covers only part of the Sun's disk and the event is called a partial eclipse. When it lines up perfectly the entire solar disk is blocked and it is called a total eclipse of the Sun. Partial eclipses are visible over a wide area of the Earth but the region from which a total eclipse is visible, called the path of totality, is very narrow, just a few kilometres (though it is usually thousands of kilometres long). Eclipses of the Sun happen once or twice a year. If you stay home, you're likely to see a partial eclipse several times per decade. + WHAT AGE IS THE SUN? The Sun is roughly middle-aged; it has not changed dramatically for more than four billion years, and will remain fairly stable for more than another five billion years. + WHAT TYPE OF STAR IS THE SUN? The Sun is a as a G2V type star, a yellow dwarf and a main sequence star. Stars are classified by their spectra (the elements that they absorb) and their temperature. There are seven main types of stars. + IS THE SUN THE BIGGEST STAR? The Sun appears so large compared to the other stars because it is so much closer to us than any other star. The Sun is just an average sized star. The largest stars, in contrast, will be cool supergiants. Case in point, VY Canis Majoris is only 3,500 Kelvin, and a really big star would be even cooler. At 3,000 Kelvin, Humphreys estimates that cool supergiant would be as big as 2,600 times the size of the Sun. It is so large that about 1,300,000 planet Earths can fit inside of it. There are eight planets and a large number of smaller objects orbiting the Sun. Mercury, Venus, Earth, Mars, Jupiter, Saturn, Uranus & Neptune. The average distance from the Sun to the Earth is about 150 million km. Light travels at 300,000 km per second so dividing one by the other gives you 500 seconds – eight minutes and twenty seconds. This energy can reach Earth in mere minutes, but it takes millions of years to travel from the Sun’s core to its surface. The effects of currently observed changes in the Sun - small variations in light output, the occurrence of solar particle streams and magnetic fields are very small in the Earth's lower atmosphere or troposphere where our weather actually occurs. However, at higher altitudes, the atmosphere reacts strongly to changes in solar activity. The ozone layer, at an altitude of 25 kilometres (16 miles), and the ionosphere, which extends upwards in a series of layers above 60 kilometres (37 miles), are produced by solar ultraviolet light and X-rays which ionize the thin air at these altitudes. 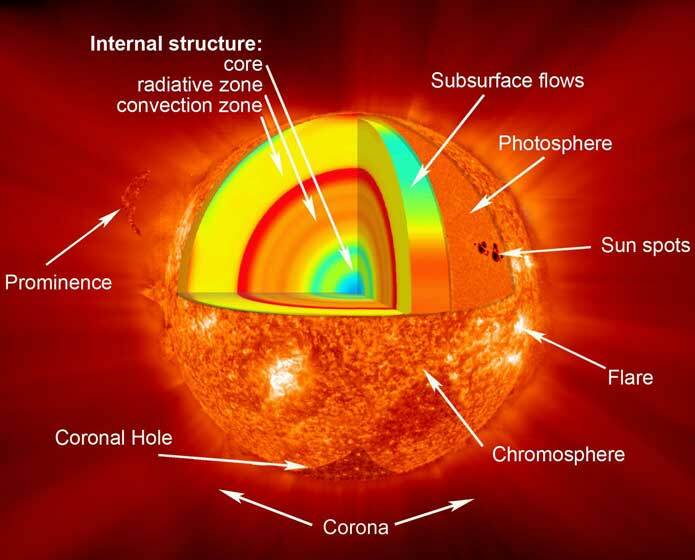 Although the visible light of the Sun is stable, large variations in X-ray and ultraviolet radiation accompany solar activity, and these variations on the Sun cause major changes in the ionosphere. Some meteorologists believe that the ionosphere changes in turn influence the weather in the lower atmosphere, but the physical mechanism by which this may occur has not been definitely identified. There is much research under way or possible relationships between solar activity and the weather.